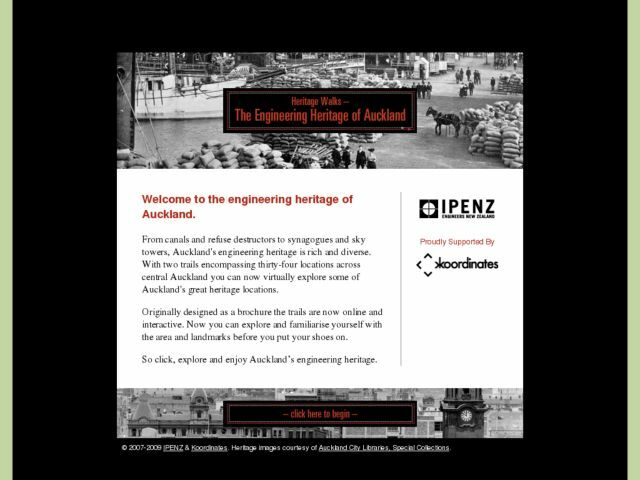 From canals and refuse destructors to synagogues and sky towers, Auckland[HTML_REMOVED]s engineering heritage is rich and diverse. With two trails encompassing thirty-four locations across central Auckland you can now virtually explore some of Auckland[HTML_REMOVED]s great heritage locations. Originally designed as a brochure the trails are now online and interactive. Now you can explore and familiarise yourself with the area and landmarks before you put your shoes on.